It is too cute a story to pass-up. Yesterday President Barack Obama rekindled his bromance with New Jersey Gov. Chris Christie as the two took a walk down the newly repaired boardwalk on the Jersey Shore. It was a photo-op meant to help Christie in his reelection effort and give Obama a chance to talk about something other than the looming scandalpalooza. Together, the two political lovers played Touch Down Fever, a game where participants try to win by throwing a football through a tire. According to a pool report, Obama took aim but missed his target several times. When it was his turn, Christie made the shot on his first and only try. 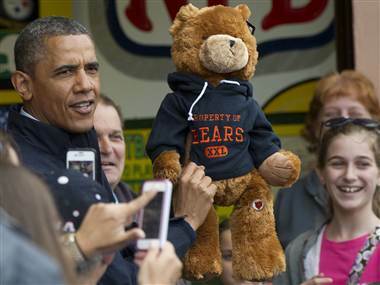 Wining a teddy bear for the Commander-in-Chief. “That’s because he’s running for office,” Obama declared, giving Christie a friendly high-five that ended with him clasping the GOP governor’s hand. The 55th governor of New Jersey then handed the teddy bear to the 44th president of the United States. It is not known if Obama kissed the governor to say thanks (at least they didn’t do it in public).